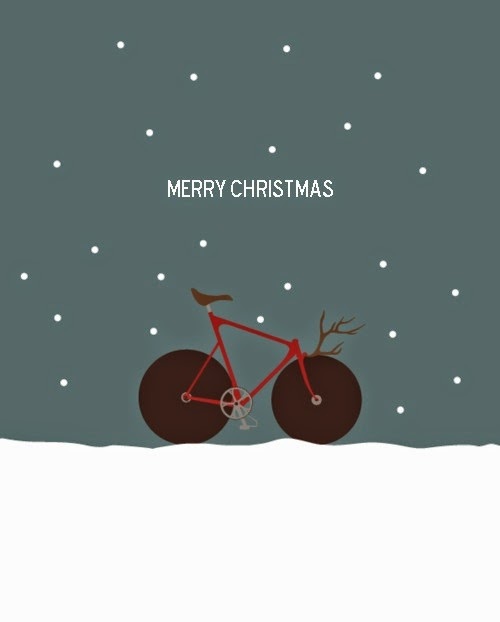 Speaking of Christmas Cards : Bikes. Rants. Adventures. I've had this on my hard drive for about a million years, and I'm absolutely in love with it. I kept forgetting to post it in the past, or I'd remember that I had it around June. With that webbing I assume it's a Rossin. Does anyone know the artist? I tried a reverse image search and got a lot of Tumblr posts and a few other cycling blog posts, but nothing that indicates a source, though I did also find a version that has been shopped to say "Merry Christmas." Rudolph the lo pro reindeer. The idea is brilliant, and I'd love to A) credit the artist, and B) ask permission to make a Takhion version. If anyone can point me in the right direction, I'd be incredibly grateful! And if the original artist does stumble across this - shoot me an e-mail, I'd love to buy a print.